You'll be £14.99 closer to your next £10.00 credit when you purchase Stilicho: The Vandal Who Saved Rome. What's this? The period of history in which Stilicho lived was one of the most turbulent in European history. The Western Empire was finally giving way under pressure from external threats, especially from Germanic tribes crossing the Rhine and Danube, as well as from seemingly ever-present internal revolts and rebellions. Ian Hughes explains how a Vandal (actually Stilicho had a Vandal father and Roman mother) came to be given almost total control of the Western Empire and describes his attempts to save both the Western Empire and even Rome itself from the attacks of Alaric the Goth and other barbarian invaders. 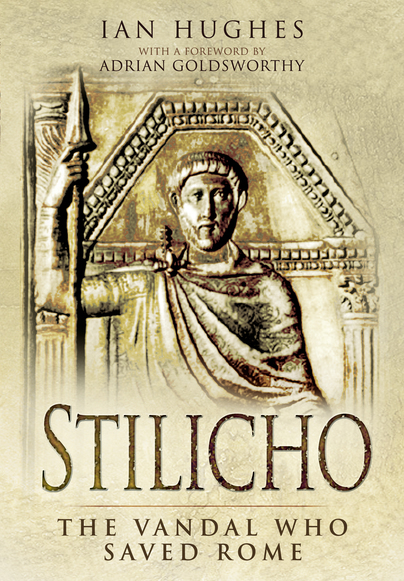 Stilicho is one of the major figures in the history of the Late Roman Empire and his actions following the death of the emperor Theodosius the Great in 395 may have helped to permanently divide the Western and Eastern halves of the Roman Empire on a permanent basis. Yet he is also the individual who helped maintain the integrity of the West before the rebellion of Constantine III in Britain and the crossing of the Rhine by a major force of Vandals, Sueves and Alans - both in AD 406 - set the scene for both his downfall and execution in 408 and the later disintegration of the West. Despite his role in this fascinating and crucial period of history, there is no other full-length biography of him in print. I found this book to be very interesting, and enlightening reading. The 21 maps add greatly to understanding the events. I was even motivated to refer to the 3 appendices (Glossary, Outline Chronology, Select Personalities). There are extensive notes and references for those who are delving more deeply. A fascinating aspect of the period was the invasion from Britain, of Gaul and Spain, and recognition by the Emperor Honorius of the invader as co-Emperor Constantine 111. Lasted only 4 years. Terrific read. I look forward to reading more of Ian Hughes’ books. A very sound and much-needed biographical addition to the scholarship of late antiquity. Highly recommended. Despite being half-Vandal, the late Roman generalissimo Flavius Stilicho in striking ways resembled the great men of the Roman Republic far more than the emperors he served. Stilicho rose through the ranks of the army to become the last consul to celebrate a triumph, and when his political enemies succeeded in a coup d'etat, he stoically accepted his execution in dramatic fashion. Hughes eloquently describes the details of this Roma life, and much more besides. His book is both a well-wrought, superbly researched biography and a thorough glimpse into the Roman world at the end of the Western Empire. Hughes deftly describes the cast of characters around Stilicho and the main events of his life, and in several excurses fleshes out his story with excellent details, as when describing the late Roman army and its opponents. If Hughes has a fault, it may be his tendency to follow the panegyric sources a bit too far in tone, although he does make a solid attempt at some revisionist arguments. Ian Hughes is the author of Belisarius: The Last Roman General (Pen & Sword, 2009) and Stilicho: The Vandal Who Saved Rome (Pen & Sword, 2010). Adrian Goldsworthy said his first book was 'packed with insights...a lively and detailed account'.